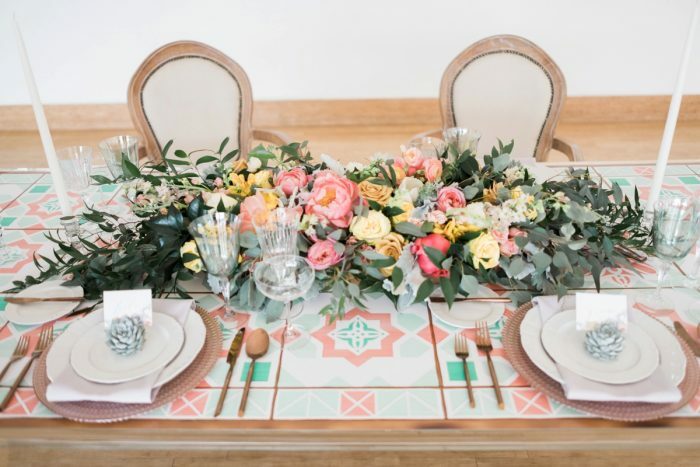 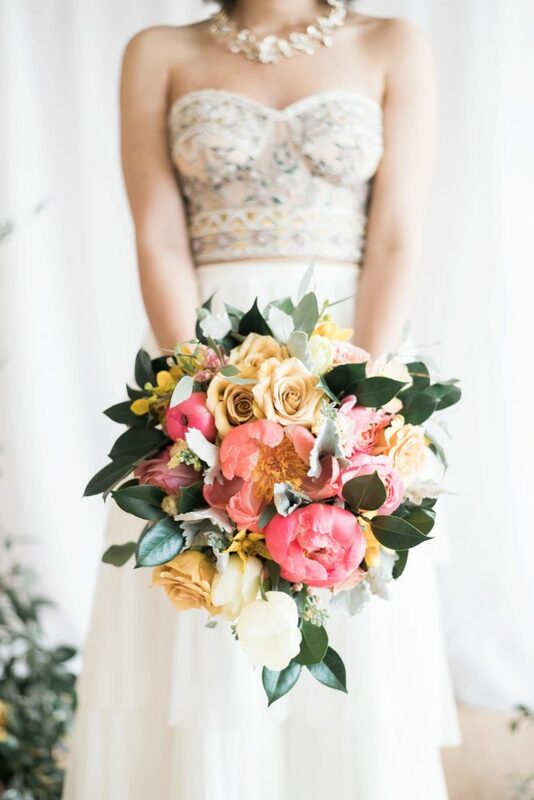 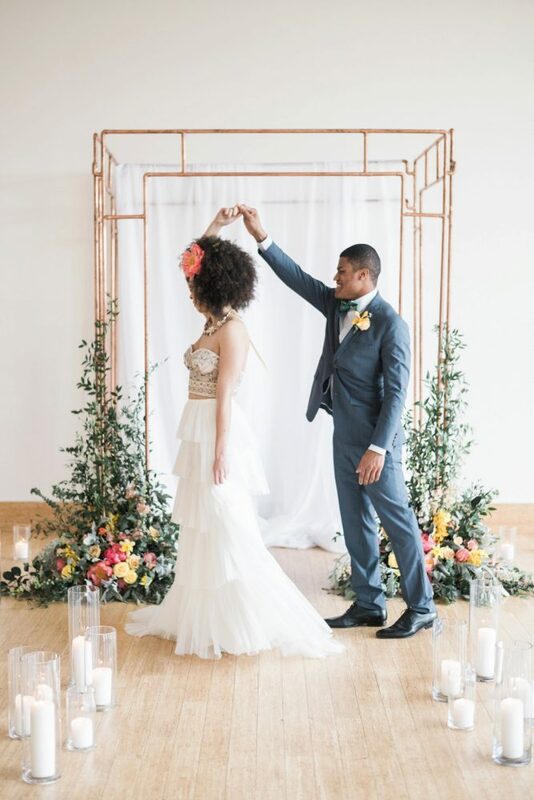 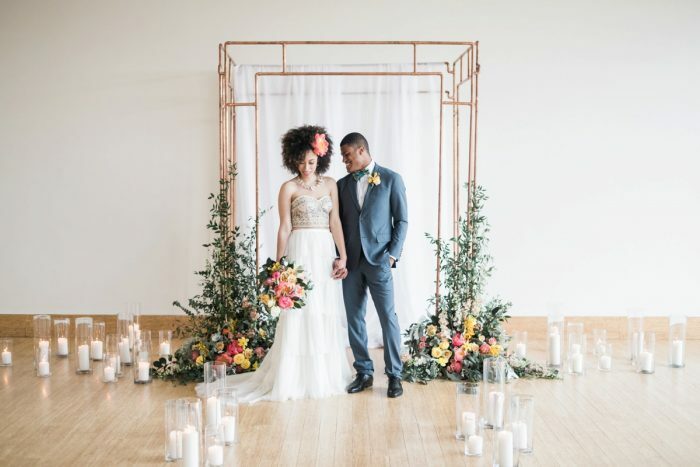 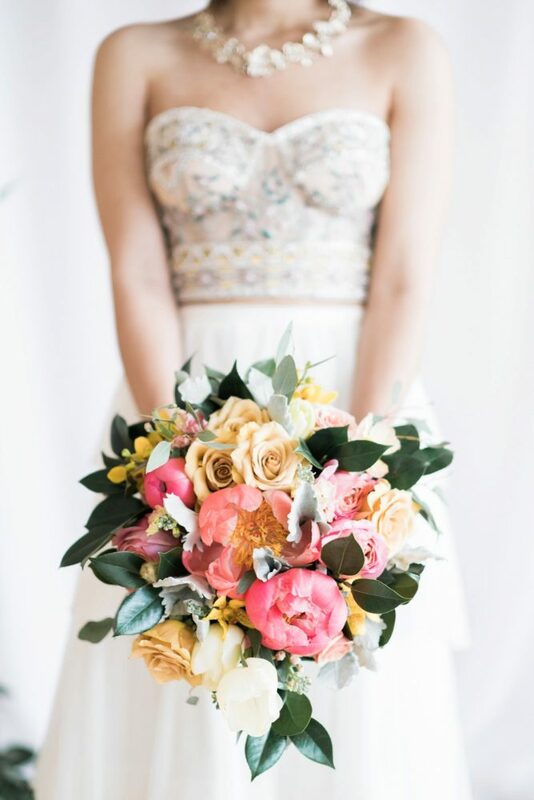 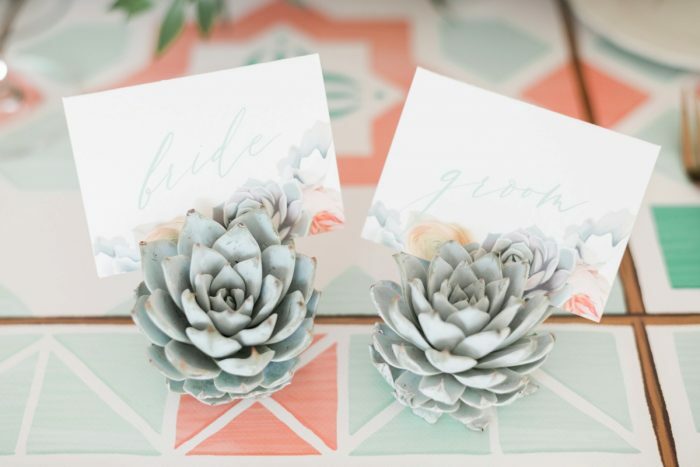 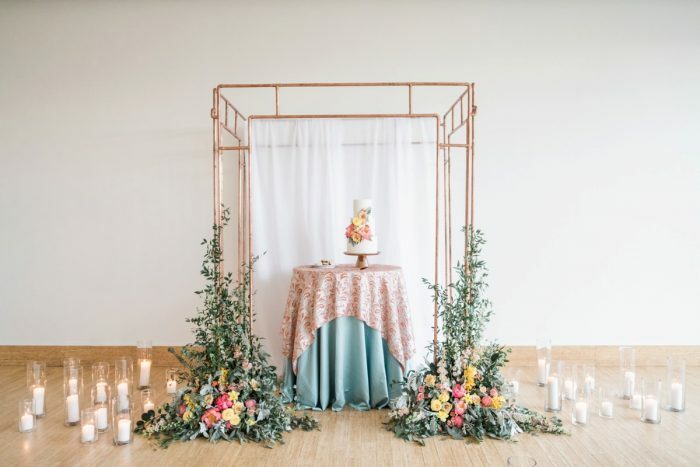 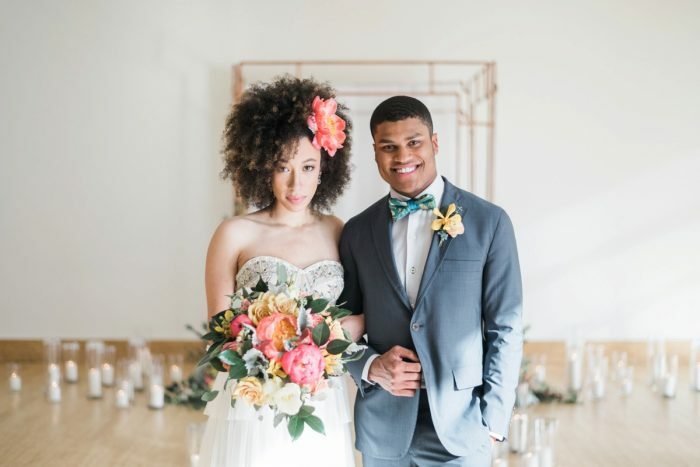 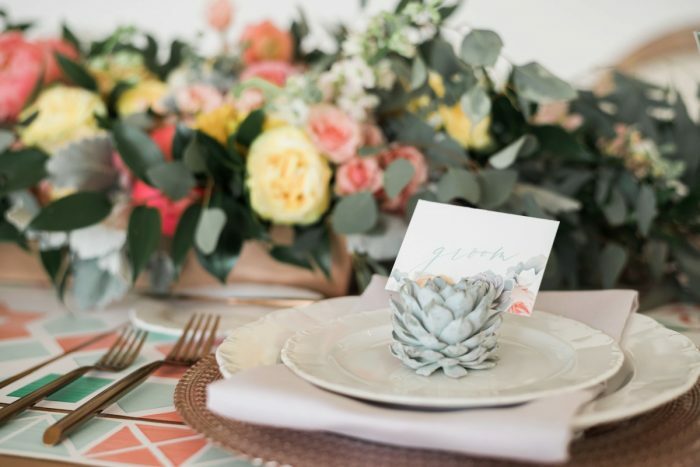 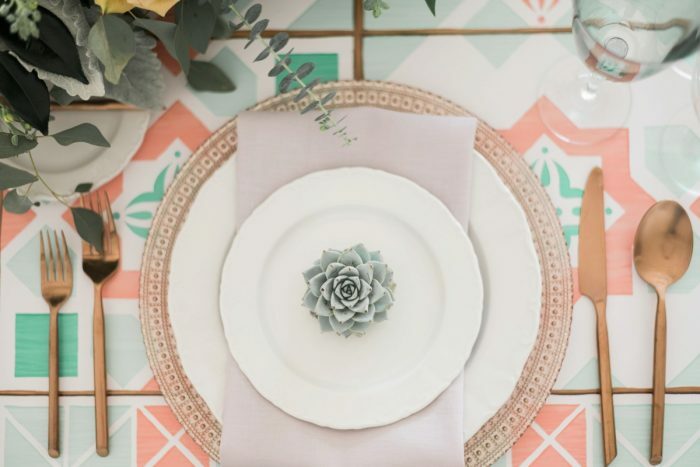 The colors of the desert come to life in this styled shoot designed and executed by yours truly and some of the BEST Pittsburgh wedding vendors. 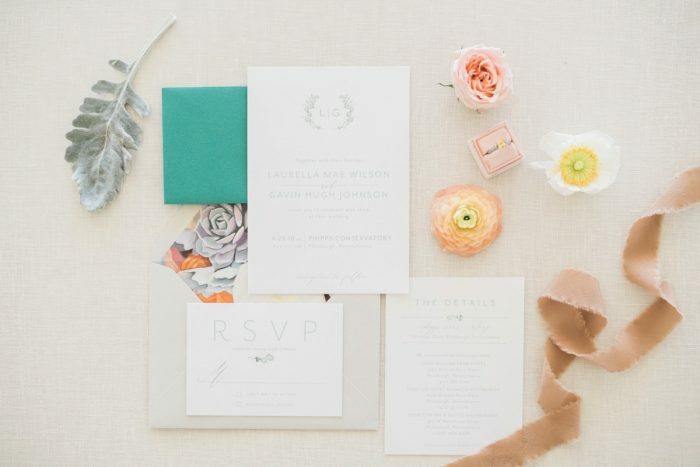 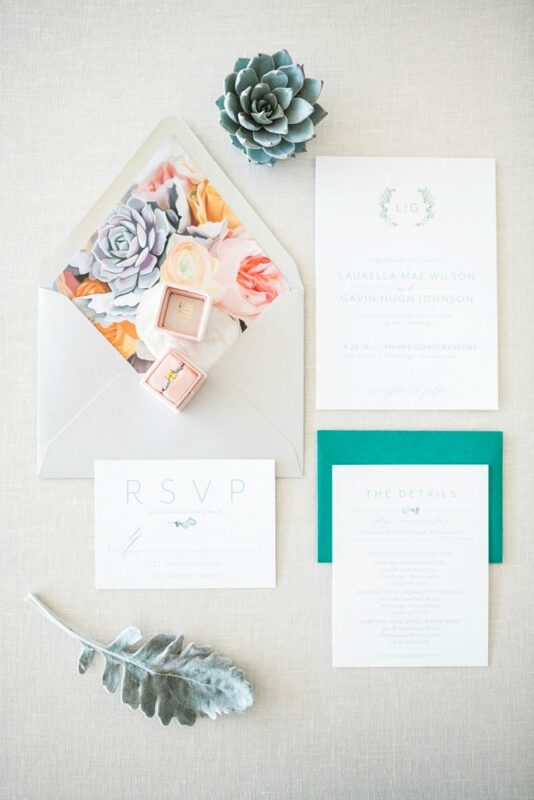 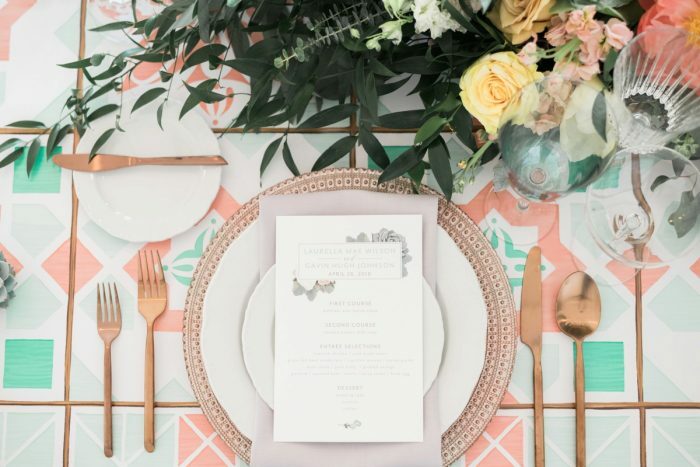 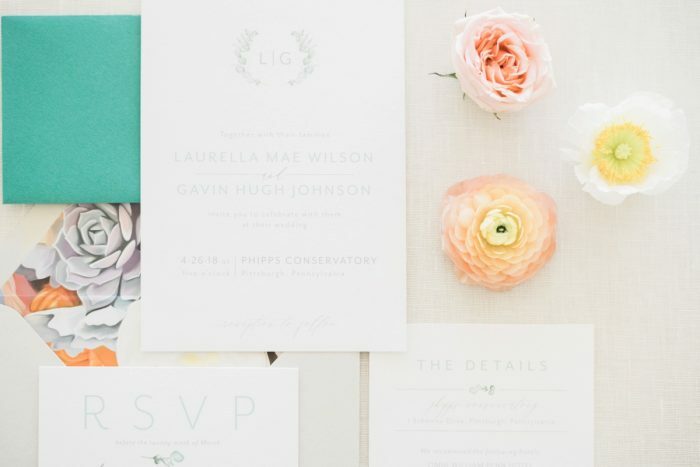 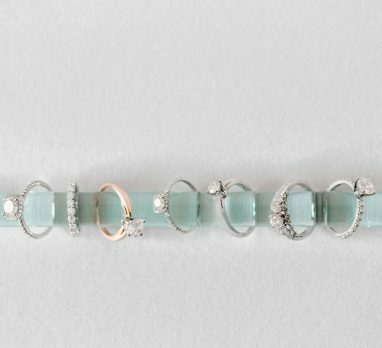 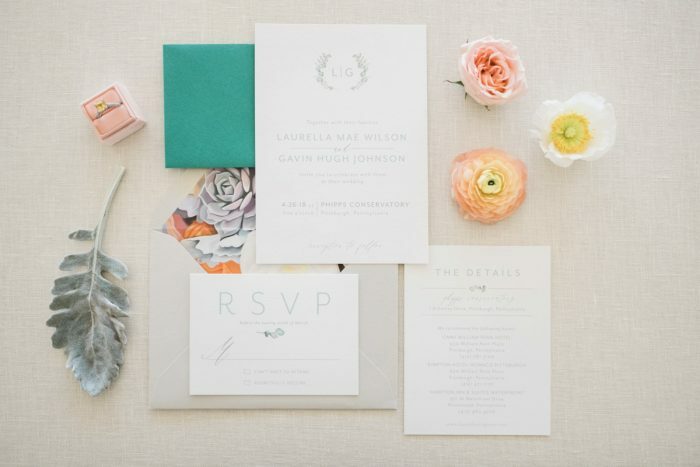 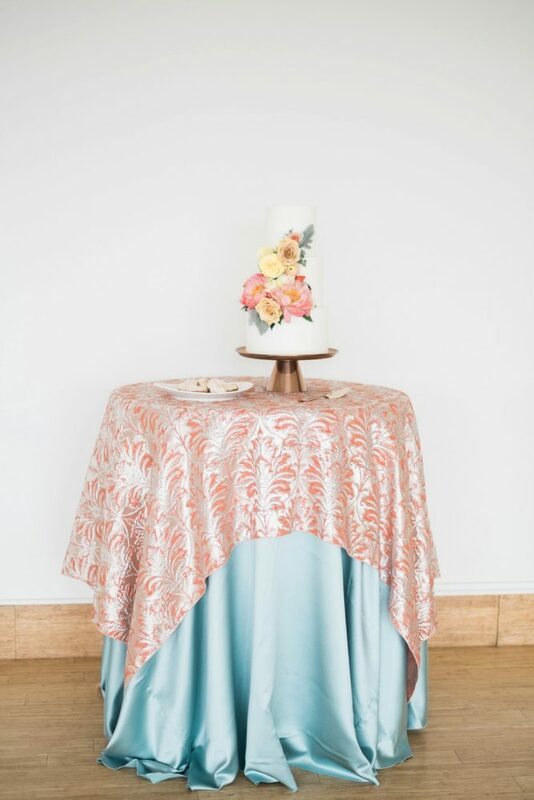 A palette of dark teal, peach, orange, yellow, and jade was originally inspired by the envelope liner of a wedding invitation suite created by Fresh Cut Prints. 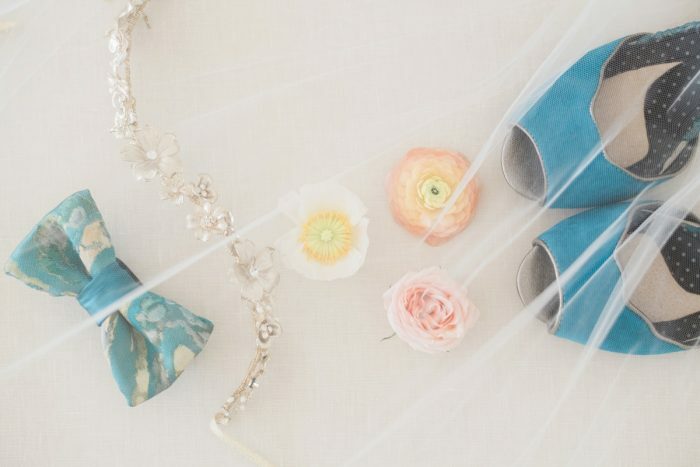 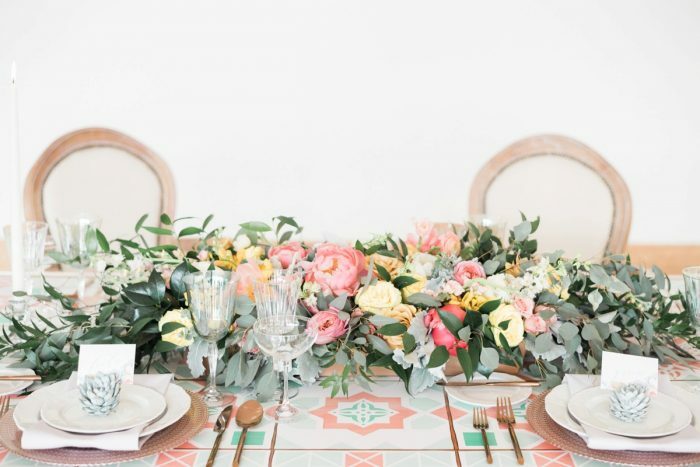 Using her floral art as our muse, the team styled a mock wedding that was colorful yet still full of elegance. 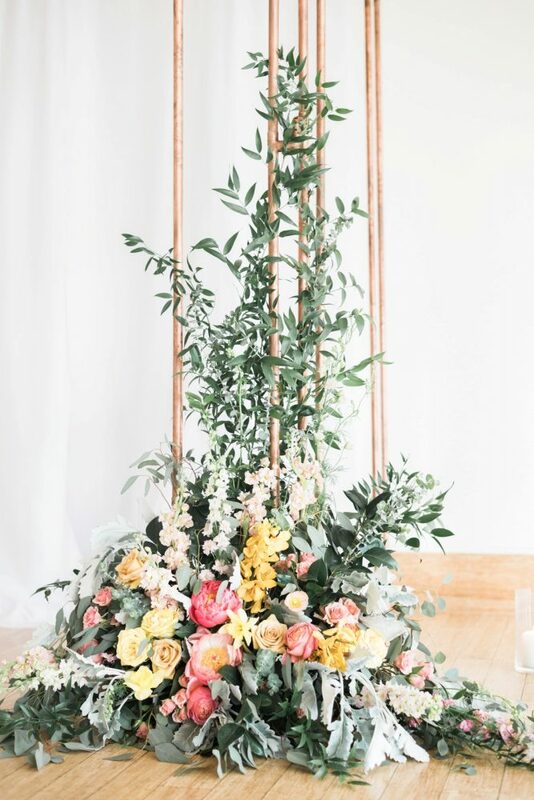 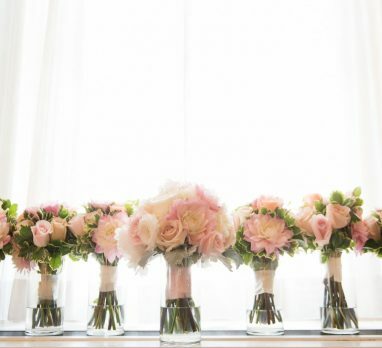 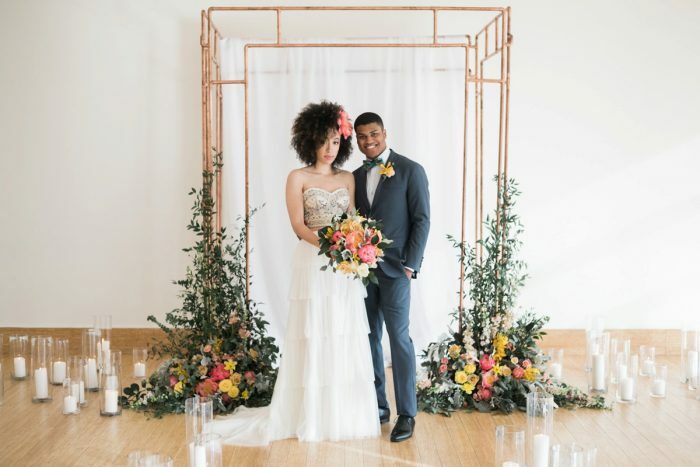 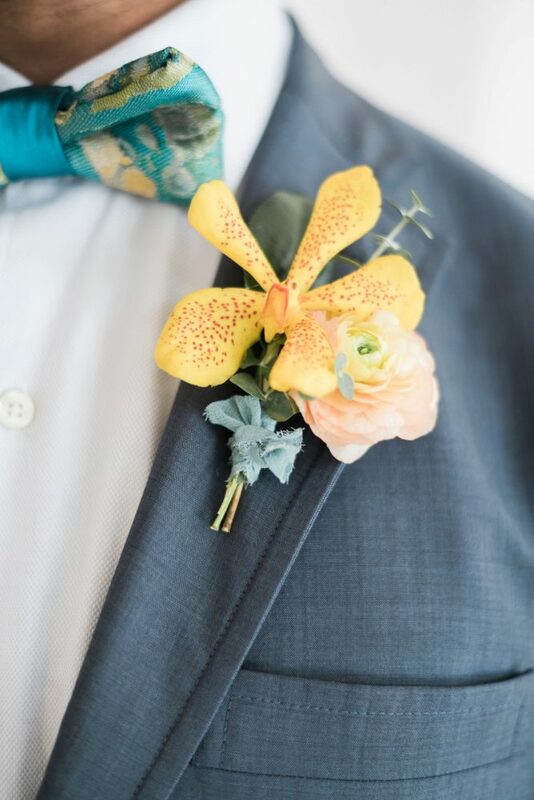 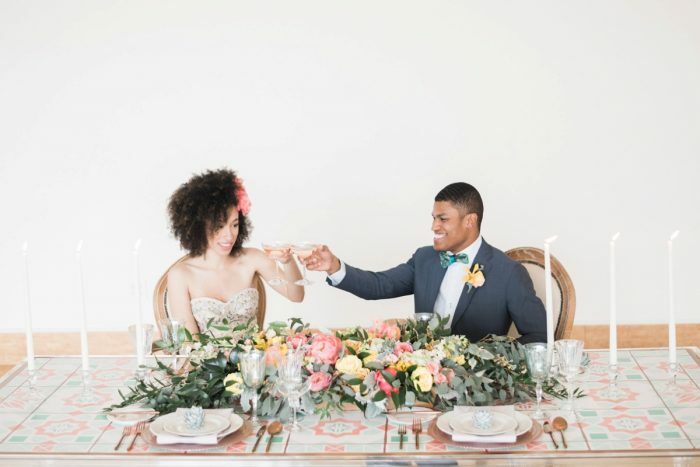 Bold and bright floral arrangements from The Blue Daisy Floral Designs were a focal point, and springtime selections of ranunculus, garden roses, coral charm peonies, and even orchids brought about visions of sunsets. 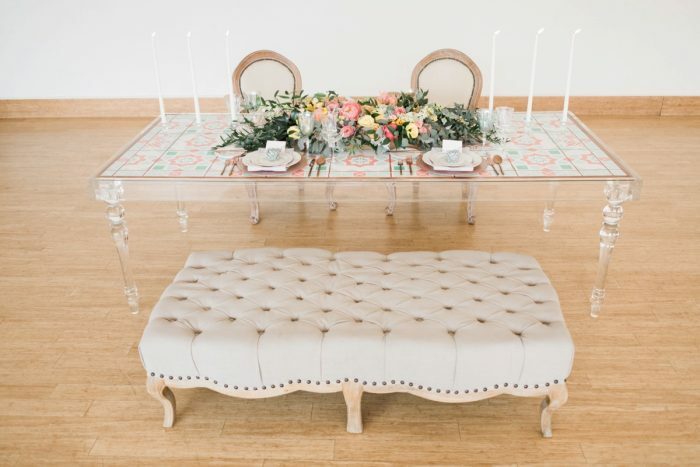 To harmonize the whimsical flowers with wow-worthy details, Marbella Event Furniture & Decor Rental supplied a show-stopping crystal lucite table with a custom-printed tile-inspired tabletop. 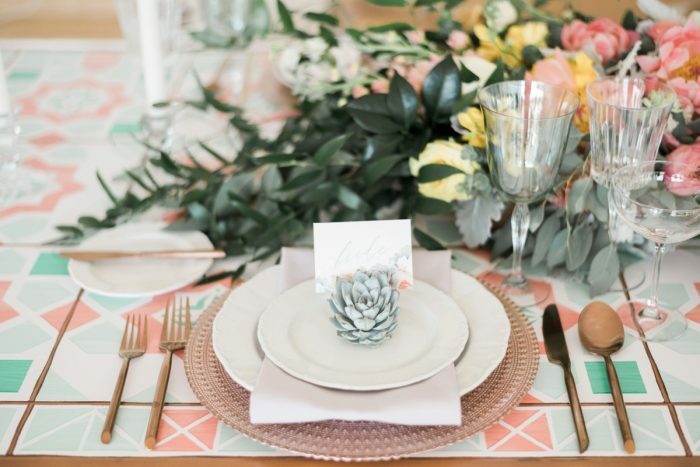 Beaded blush chargers, stylish sea foam green glassware, and copper flatware, all from All Occasions Party Rental, completed our tablescape. 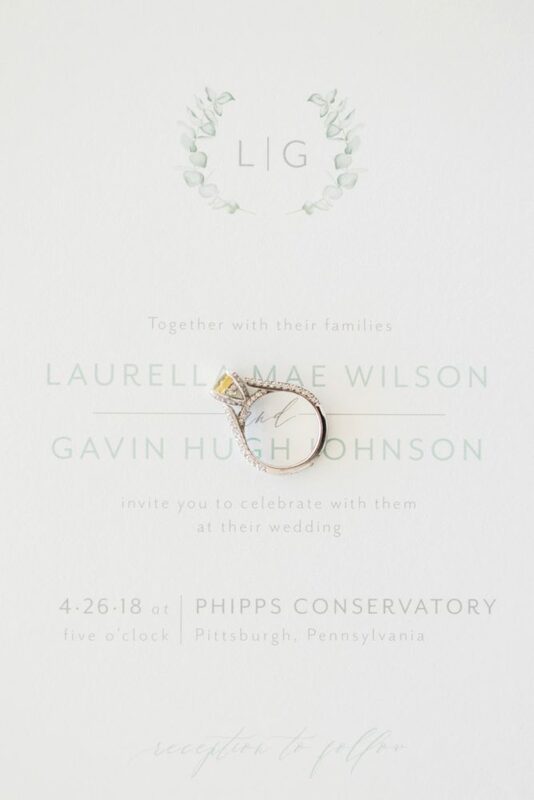 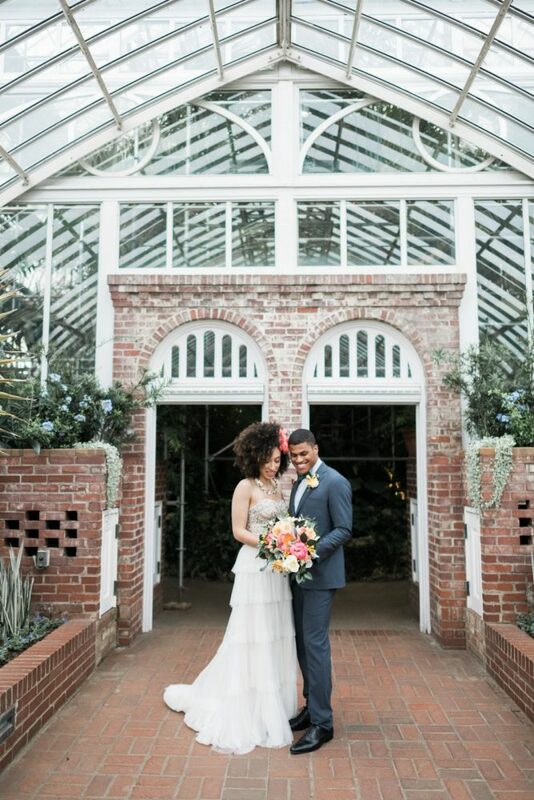 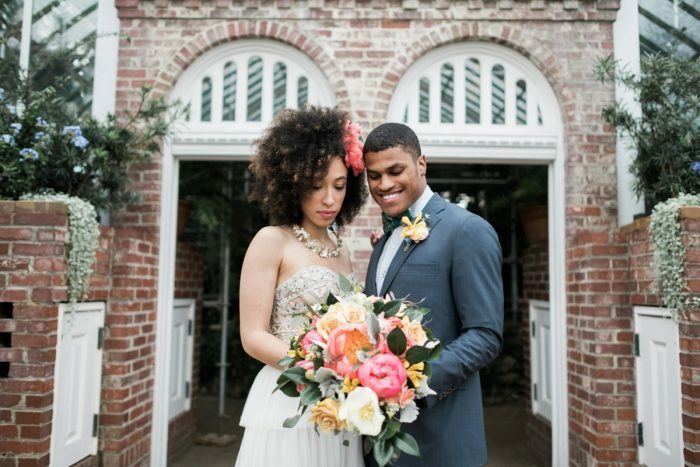 No location was better suited for our vision than the natural garden vibes of Phipps Conservatory, where all of our wedding inspiration dreams came true. 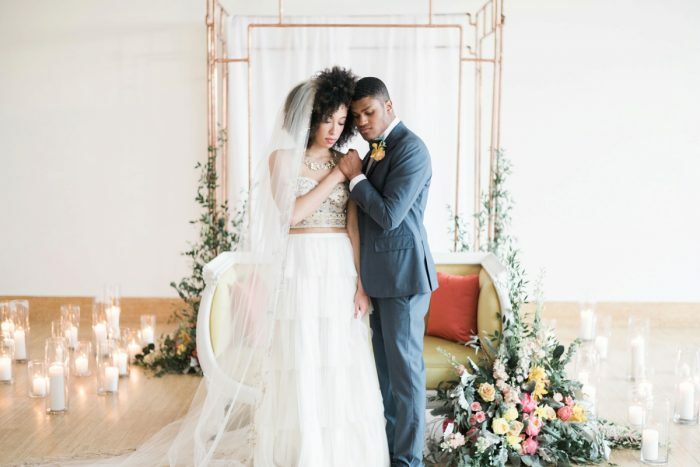 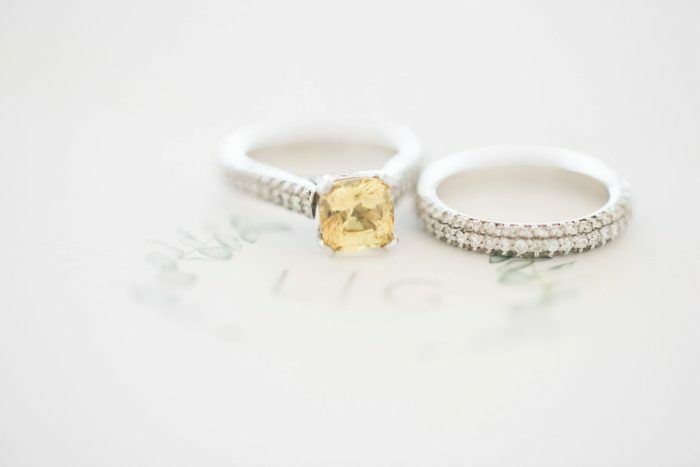 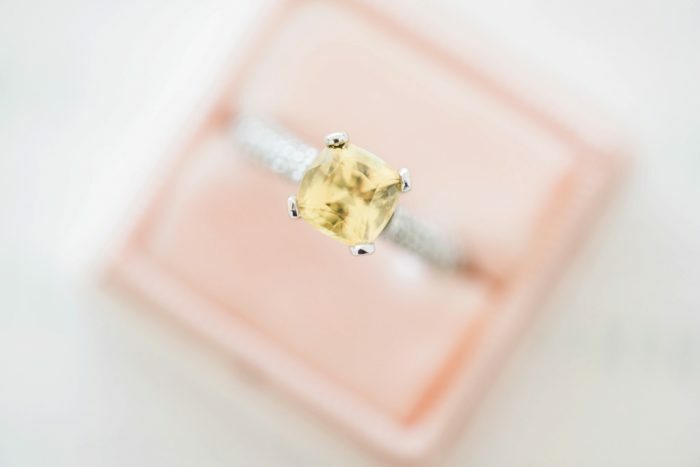 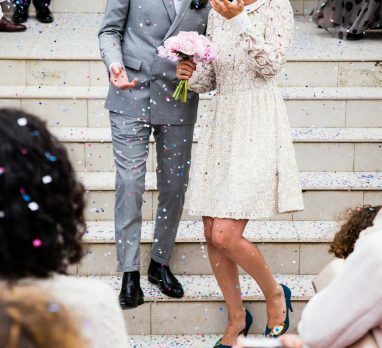 This is no mirage, friends; the images from Levana Melamed Photography and the video footage from Traveling Heart Productions really are this amazing. 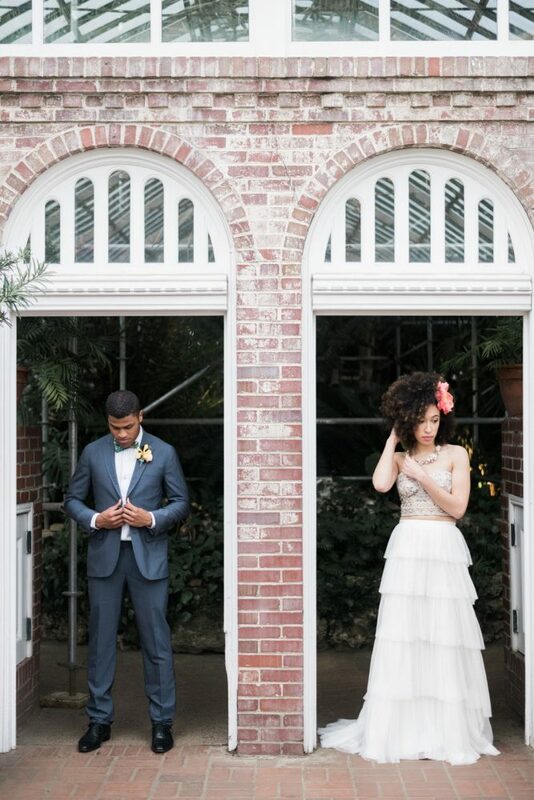 Desert tones even made an appearance in our model’s ensembles. 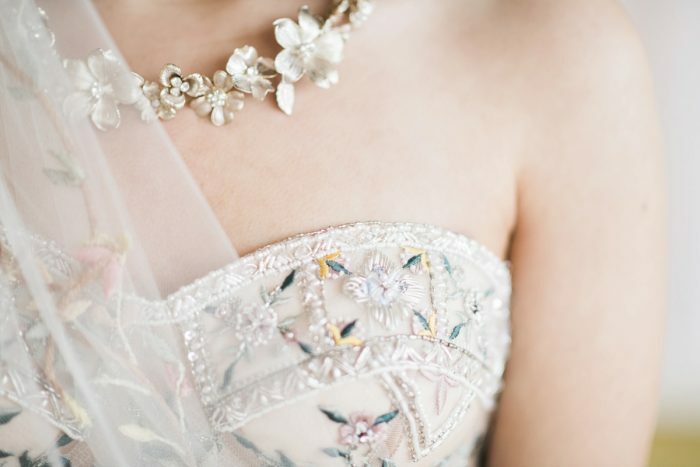 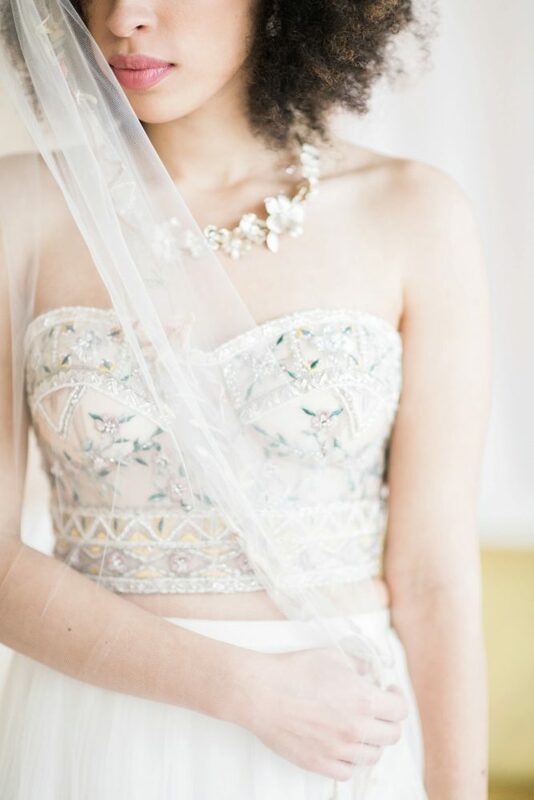 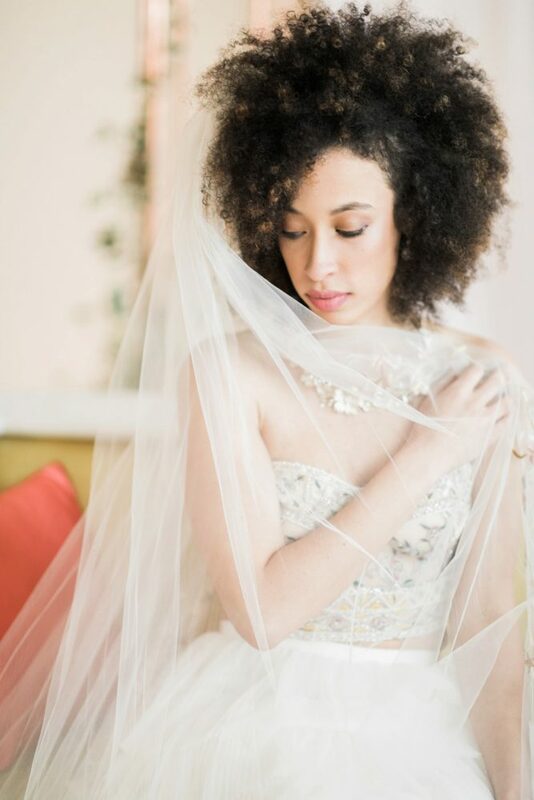 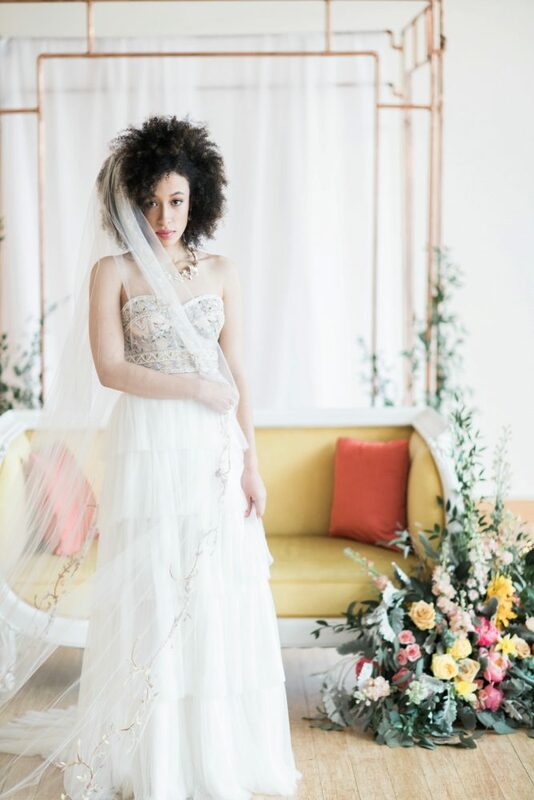 Cat wore a billowy tulle skirt and embroidered beaded bodice, both Willowby by Watters and available at Bridal Beginning. 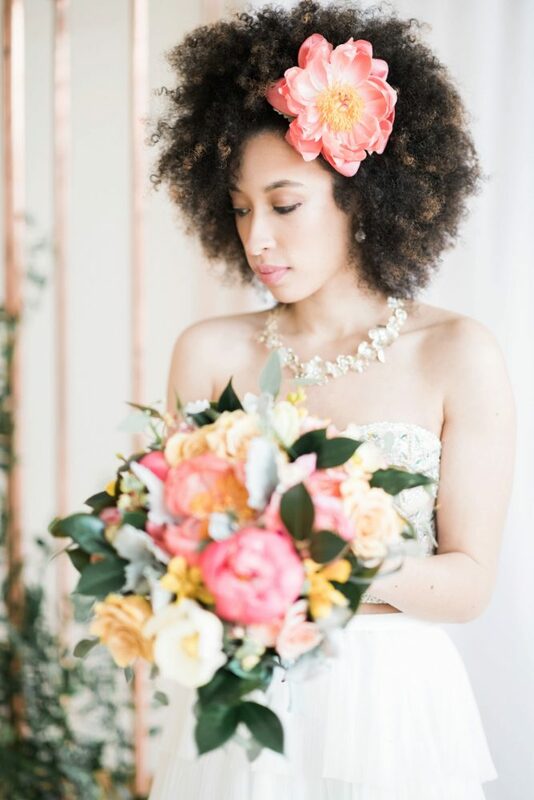 Her makeup and hair, both done by JL Makeup Studio and Beauty Boutique, were kept natural with subtle pops of color. 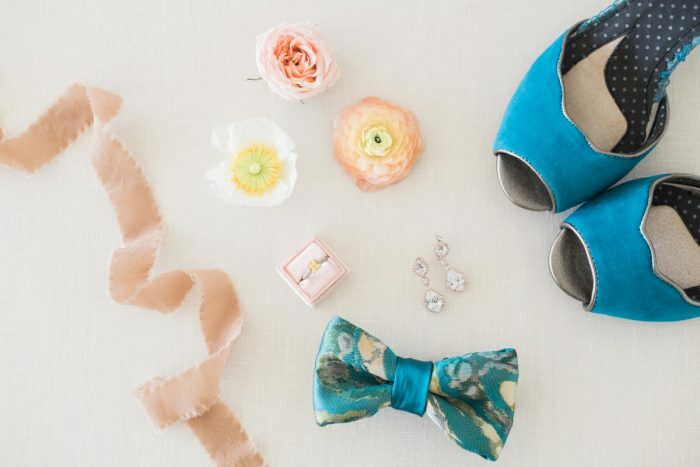 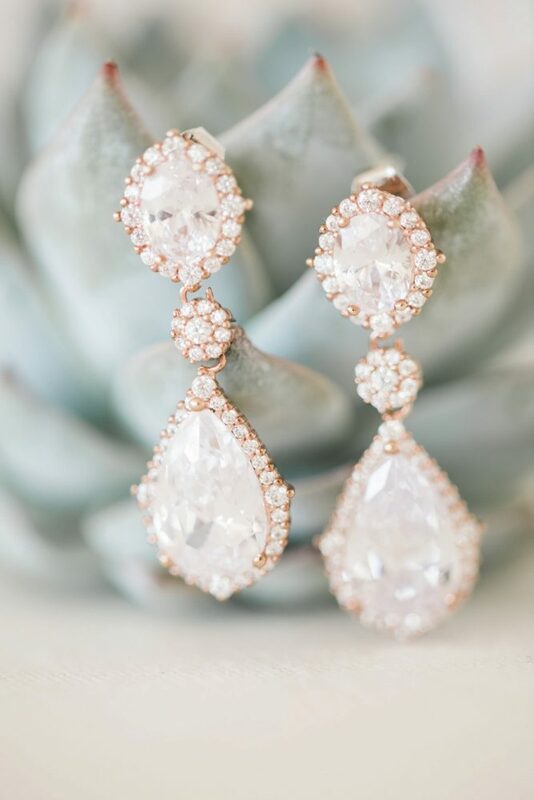 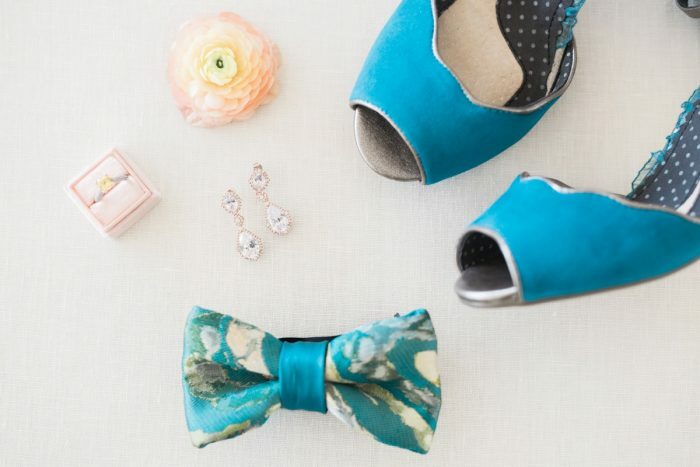 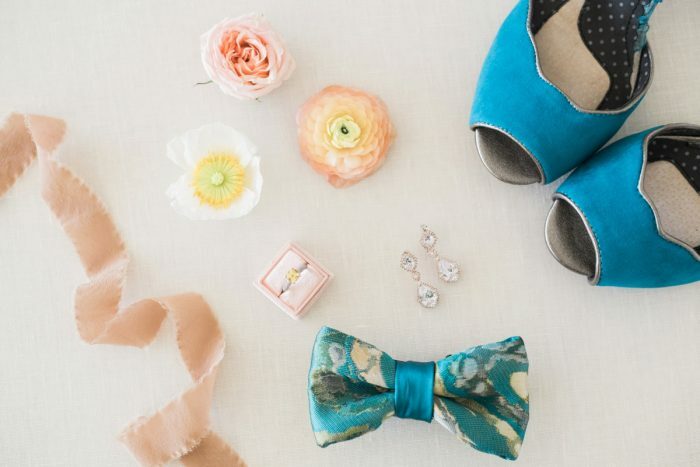 Unique bridal details such as velvet peep toe heels from ModCloth and a jaw-dropping yellow sapphire ring from Caesar’s Designs completed her look. 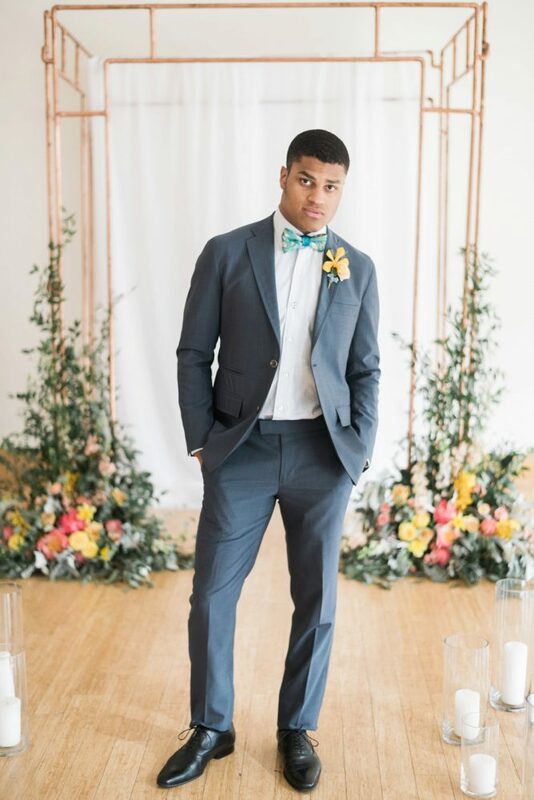 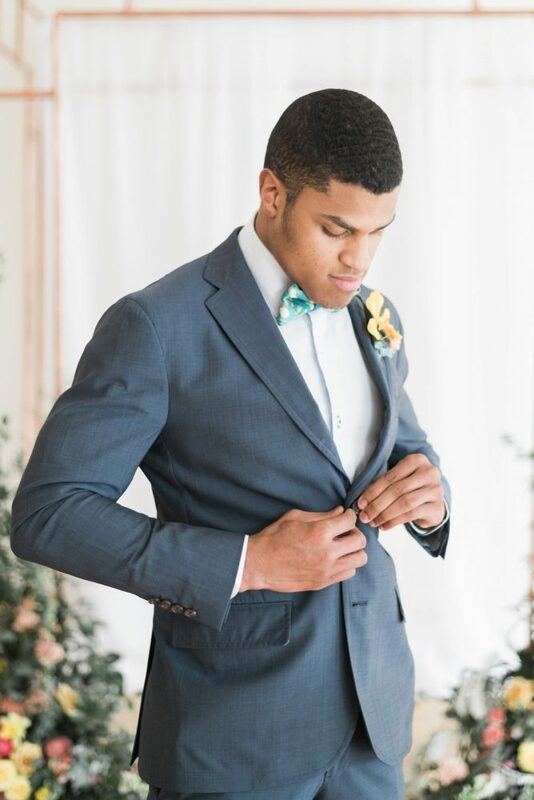 Meanwhile, groom Jordan rocked a custom suit from Commonwealth Proper topped off with a striking bowtie from Knotzland. 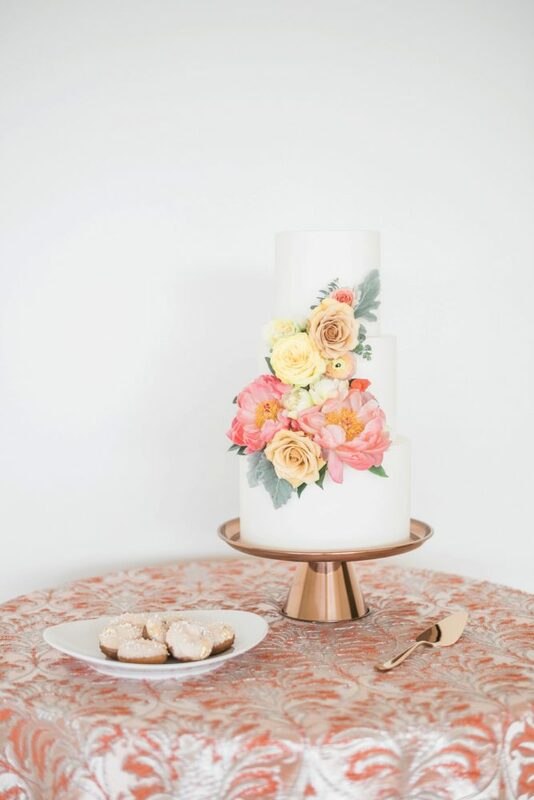 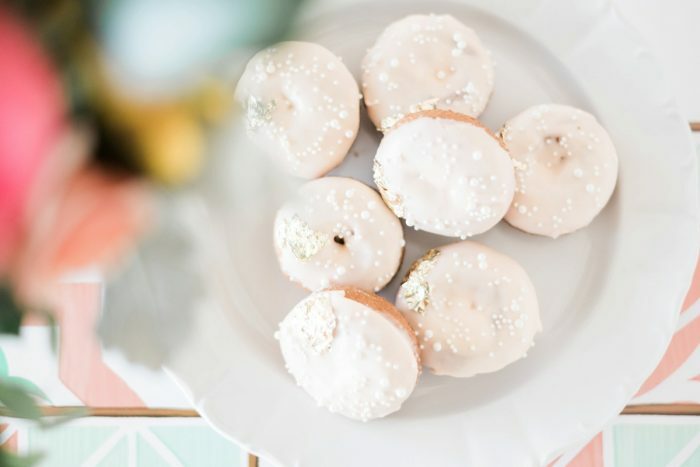 Gold-leaf donuts and a simple tiered cake, both by Mediterra Bakehouse, sat atop Mosaic’s brocade and satin linens, matching our color scheme. 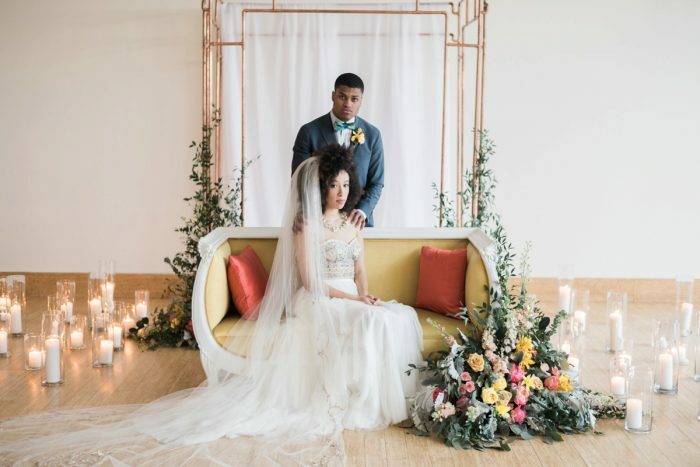 There was even a sunny yellow vintage settee from Old Souls Vintage Rentals to round out the color-based styling!